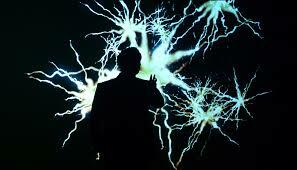 887 is written, designed, directed and performed by Robert Lepage. Lepage is often described as a visionary director and playwright; It would seem he is one of theatre’s best people. Does he occupy that space by accident? Does he hell. Nothing about this performance is left to chance. This was the first show I had ever seen of his… It’s not perfect but its high points are great enough to compensate for odd sequencing and occasional framing misfires. His examination of memory gleans magical childhood memories, the unconscious mind and the importance of remembering. The inventive set transforms from the childhood address at 887 Murray Avenue in Quebec City, to a taxi and then a diner, and these transitions are infused with finesse and an accomplished cinematic fluency. There is some seriously skilled execution of technology that compliment the remarkable storytelling. But the personal tale blends life story and critical commentary, while questioning identity. Generally, men have not been able to talk about emotional histories of their relationships with their fathers (or lack of), Lepage breaks open some of these silences. His father had served in the navy and later in life as a taxi driver working all hours to provide for his family. Lepage reconstructs and presents a childhood that seems to summarise an emotional structure in his life- a framework of loss, grief and the quest for greater closeness to his father. What is now needed is for more men to start excavating, in public, the sediment layers of their own history. It is a story of displacement as a way of understanding male life crisis – you get the sense that this part lecture and part autobiographical performance could galvanise a radical disjuncture in helping some men to deepen their conscious critical reflection. At two hours and fifteen minutes (no interval) the piece loses momentum. That’s a frustration; it is not a performance-destroying problem. It’s a stripping away of the onion-skin layers of memory and the difficulties in this approach lie in the assumption that there is a stable, coherent identity, or a kernel of ‘I’-ness just waiting to be uncovered. Over a prismatic theme, Lepage determinedly equates memory with autobiography, political history, ego and ritual and achieves a delicate balance between frivolity and spiritual gravity. It’s a spectacular performance. At times witty, while at other times, reflective, thoughtful and quite tragic. Are men born manly? This is a detailed investigation of gendered identity using Lepage’s personal history to explore specific themes of identity and manliness. In doing so he offers some positive challenges to the psychological and social forces active in all of our development. There is lots to be excited about here. 1. Where are the jokes? There could at least be a GIF. 2. Too bogged down in ‘grand’ theories about masculinity. 4. You’re likely to be better off with Matt Trueman’ review for WhatsOnStage or Lyn Gardner in The Guardian, both of which deal with the points above and, undeniably, do so with considerable aptitude.